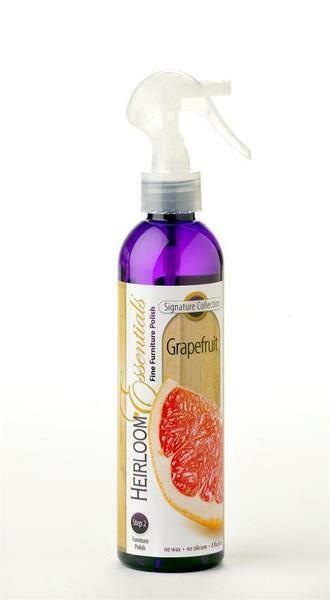 Our Grapefruit Scented Furniture Polish is refreshingly fruity and deliciously tart. What a perfect combination! Heirloom Essentials Fine Furniture Polish is will become your favorite fragrance! This Silicone Free hardwood polish will maintain the luster of your furniture and ensuring it's heirloom quality. Woodwright® has been developing quality stains, varnish and furniture polishes for solid wood furniture and cabinetry for years. This Amish furniture polish will have your home or business smelling fabulous for hours! This furniture polish does not contain wax or silicone so it will not leave a buildup or film on your furniture. The finest oils are used in this polish! Your fine furniture will be protected and preserved so it is sure to remain a family heirloom that has been passed down for generations. Be sure to check out our other furniture polishes scents available! Call 1-866-272-6773 with questions!